Alvin® Ensign Table, White Base White Top 36" x 48"
Home > Drawing Supplies | Drawing Tables & Art Tables | Alvin® Ensign Table, White Base White Top 36" x 48"
If you are looking for a way to enhance your work space without compromising functionality, the Alvin Ensign Eggshell Base 36X48 Top is a useful and attractive solution. The easy to use brake lever allows you to adjust it in two ways: board height and board angle. Using heavy guage steel, the double pedestal design of the Alvin Ensign Eggshell Base with 36X48 Top offers superior stability and functionality. The rounded profile of this architect’s necessity enhances the look of any environment. Both the height of the unit, as well as the angle of the warp free, white Melamine board, are easily adjusted using the extendible brake lever. Change the angle of the board from 0 to 90 degrees to suit your project. 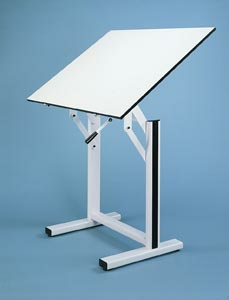 Height adjustment varies from 35" to 47" to accommodate a range of needs. Traction springs balance and regulate both height and angle adjustments. Enjoy easy assembly with the tools provided with this unit.